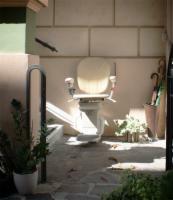 Outdoor stair lifts are designed to be suitable to most environments and weather resistant. The electrical components are sealed to protect against moisture and the lift is specially coated to prevent rust. Great for use on the front steps, an outdoor stair lift can be used in most homes. Do you already own a battery operated stair lift and need new batteries? Look no further, see our replacement stair lift batteries.